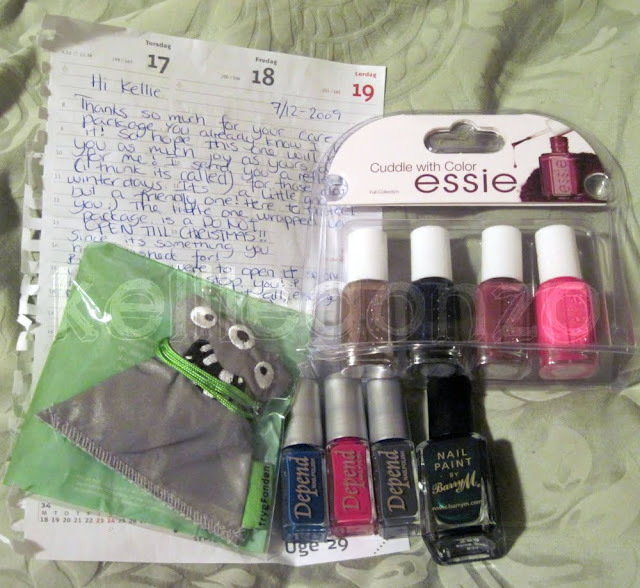 here is a quick post on a present i got from my dear maria from "polishing the nails!" blog (aka rijah). what a sweetie huh! it was our own little christmas exchange. she gave me the awesome essie "cuddle with color" collex minis, three depend polishes(! ), and a barry m polish i was majorly lemming, racing green :D she also wrote the nicest note and sent me a sweet little reflective ghost! i named him "Bernard (BER-ner-d) Mason Swallow" and he is hanging next to my desk at work! have a great day my sunshines!